Contrary to the Quantity Theory of Money, which in its various forms, implies that increases in output of goods and services will, ceteris paribus, exert downward pressure on the general price level, Abraham E. Nwankwo in this book, argues that the growth of some components of output could accentuate, rather than dampen inflation. This phenomenon, which the author has termed ‘Disaggregation Dissonance Hypothesis’, states that while some components of the GDP may be inversely related to the price level, other components may be positively related to the price level. In addition, interaction between sectors, measured for example with the ratio of non-agricultural output to agricultural output, could also affect the price level. 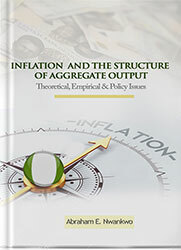 In view of these observations, the author argues that the practice based on the Quantity Theory of using aggregate output as an explanatory variable for the price level is defective and inappropriate and that the use of aggregate output in an empirical study is of limited relevance because it obscures a lot of the underlying influences which are necessary for understanding the structure and dynamics of inflation. He contends that a more appropriate approach will be to use disaggregated components of the GDP, as well as sectoral interaction variables in order to bring out the different ways in which the different components of the GDP impact inflation. The author supports his thesis with an econometric investigation, using Nigeria’s data from 1960 to 2011, which shows that when the GDP is split into agricultural and non-agricultural components, the former impacts the price level inversely, while the latter impacts the price level positively. Abraham E. Nwankwo holds a Ph.D. degree in Economics from the University of Nigeria Nsukka, where he also obtained his Bachelors and Masters degrees in the same discipline. After a few years of lecturing at the same University, he had a versatile career in banking where he rose to top management positions. He veered into public service in 2001 when he joined Nigeria’s Debt Management Office and in 2007 became the Director-General of the agency. He had previously authored Stable Growth and Foreign Exchange and four other books in creative writing: TATU (Drama), Minds of Time (Poetry), Oracles for Heroes (Prose) and Through the Storm (Drama).